“Often referred to as ‘the last verismo soprano’, Magda Olivero was an artist whose total immersion in her roles combined with astounding vocal longevity to earn her legendary status among lovers of expressive singing. 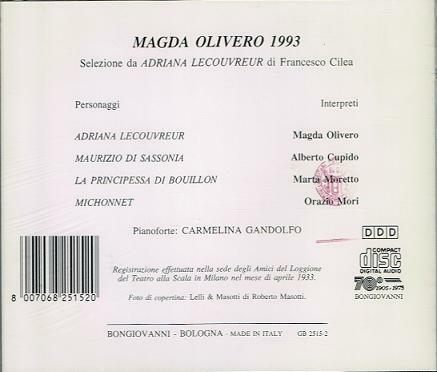 Young Magda studied piano, harmony, counterpoint and then voice, auditioning at Turin’s EIAR radio for conductor Ugo Tansini, whose appraisal has become part of the Olivero legend: ‘She possesses neither voice, musicality nor personality!... She should look for another profession’. A second audition produced the same response, but also aroused the interest of voice teacher Luigi Gerussi, who offered to train her. After a period of arduous vocal study, Olivero made her major-role stage debut in Turin as Lauretta in GIANNI SCHICCHI in 1933, the same year bowing at La Scala as Anna in NABUCCO. Her easy high notes and impeccable coloratura led to roles such as Gilda, Manon and Sophie, and she was encouraged by Tullio Serafin to specialize in bel canto repertoire. But Olivero’s heart was in verismo, and she had the opportunity to work closely with a number of composers, including Giordano, Alfano, Mascagni and Cilèa, sometimes creating roles for them, always gaining their admiration. (Thirty-one of the forty-four composers whose operas Olivero sang during her career were still alive when she began to study.) In 1938, Olivero sang Liù in the world-premiere recording of TURANDOT, one of her few commercial recordings, and in 1939 she sang her first Adriana Lecouvreur, the role with which she became most identified. Olivero married industrialist Aldo Busch in 1941, abandoning her career for a decade, singing only occasional concerts to aid charities during the war. Francesco Cilèa, who considered Olivero the greatest interpreter of his Adriana, finally persuaded the soprano to return to the stage. Writing to her, Cilèa insisted it was Olivero’s duty ‘toward her public and her art’. 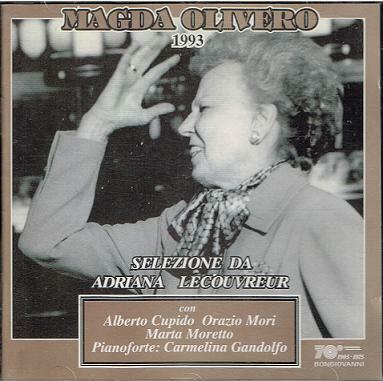 The elderly composer was dying and wanted to hear Olivero as Adriana one last time. When she worked on the role with him, Cilèa declared Olivero had ‘gone beyond the notes’ to what he felt when he created Adriana. Two weeks after returning to the stage as Mimì, on 20 January, 1951, Olivero sang Adriana; sadly, Cilèa had died months earlier, but he was the catalyst for an astounding second Olivero career phase, lasting four more decades. Although Olivero kept singing Manon and Violetta, this second career focused mainly on verismo heroines — Suor Angelica, Butterfly, Fedora, Manon Lescaut, Margherita (MEFISTOFELE), Iris, Minnie, Giorgetta (IL TABARRO) and Tosca. She also continued to participate in premieres of new works, by Renzo Rossellini, Ottorino Gentilucci, Flavio Testi and Gian Francesco Malipiero. Olivero won acclaim in Menotti’s MEDIUM and Poulenc’s DIALOGUES DES CARMÉLITES (Mother Marie) and LA VOIX HUMAINE, and as a hair-raising Kostelnicka in JENUFA at La Scala. Her career expanded beyond Italy, and a U.S. debut took place in Dallas in 1967, where, she was persuaded, after some hesitation, to sing Cherubini’s Medea. Her reticence, based on the success of Maria Callas in the role in that city, proved unfounded; the performances were a sensation. New York area performances began in 1969, in Hartford Connecticut, with her legendary Adriana. The enterprising Maestro Alfredo Silipigni then brought Olivero to his New Jersey State Opera; local opera lovers journeyed to Newark for unforgettable Olivero evenings of TOSCA, FEDORA and MEFISTOFELE. In the meanwhile, a Philharmonic Hall debut in 1971 featured the soprano in a recital coupled with LA VOIX HUMAINE in the same evening. But it was not until 1975, at the instigation of her great admirer Marilyn Horne, that the Met finally invited Magda Olivero for three performances as Tosca. She made her debut soon after her sixty-fifth birthday. Although the audience was wildly demonstrative, this was no mere nostalgia event. After a few minutes to warm up and conquer nerves, Olivero’s voice was astonishingly fresh, shedding decades by Act II. At the second performance, this listener was treated to the most touching, spectacularly sung ‘Vissi d’arte’ of his experience. During Act III, Olivero’s ascent to a spectacular, lengthy high C and plunge down two octaves into chest voice on the line ‘Io quella lama’ earned her a spontaneous ovation. This old-school audience response was inspired by the artist’s old-school stage deportment; it was an evening that, in the best sense, turned back the clock whenever she was onstage. Olivero’s total belief in the reality of the drama prevented her performances from ever being reduced to shtick. And her prodigious technique and breath control spoke of a bygone era, but one in which she was unique among veristas, none of whom matched her vocal capabilities. “Magda Olivero, an Italian soprano who for decades whipped audiences around the world into a frenzy of adulation that was operatic even by operatic standards — despite the fact that by her own ready admission she did not possess an especially lovely voice. Miss Olivero began her career in Italy in the 1930s and had largely retired by 1941. Coaxed back to the stage 10 years later [by Francesco Cilèa, composer of ADRIANA LECOUVREUR], she enjoyed renewed stardom in Europe and the United States. Her long second act — she made her Metropolitan Opera debut at 65 and continued to sing elsewhere for decades — was driven in no small part by the ardor of her fans. For decades, bootleg recordings of Miss Olivero’s voice, tenderly husbanded, passed from hand to covert hand among her legions of acolytes. At live performances, she took the stage to screams of ecstasy and left it to thundering ovations. Singing the title role in Puccini’s MANON LESCAUT in Verona, Italy, in 1970, opposite a young tenor named Plácido Domingo, Miss Olivero required police protection from the hundreds of audience members who tried to swarm the stage. Nevertheless, some concertgoers, and many critics, found her singing untenable. Writing in THE TIMES in 1969, Peter G. Davis reviewed Miss Olivero in her most famous role, the title part in Francesco Cilèa’s ADRIANA LECOUVREUR, with the Connecticut Opera Association in Hartford. ‘Her voice is not a beautiful one by conventional standards’, he said. ‘The tight vibrato, hollow chest tone and occasionally piercing upper register are qualities that one must adjust to’. In spite of these limitations, or perhaps because of them, Miss Olivero distilled her voice and stage manner into a potent combination that many listeners found bewitching. She was often called the last of the verismo sopranos, hewing to the end of her life to an operatic tradition — grandiose, stylized, hyper-realistic and nothing if not melodramatic — that had its heyday at the turn of the 20th century in works by Leoncavallo, Mascagni and Puccini. ‘She reigns supreme, singing with an abandon and fervor that will leave you exhausted’, American Record Guide noted, approvingly, in 1997, reviewing a two-disc set of arias Miss Olivero recorded in the 1960s and ’70s. Her signature roles included the title parts in Puccini’s TOSCA, Umberto Giordano’s FEDORA and Luigi Cherubini’s MEDEA, as well as Liù in Puccini’s TURANDOT. Where many opera stars of Miss Olivero’s day gave little heed to acting, she inhabited her characters with impassioned fervor, possessed of an onstage carriage and an array of grand gestures that could make her arias seem declaimed as much as sung. Though the instrument with which nature endowed her was not Olympian, her arduous training gave her such immense technical facility — crystalline diction, superb breath control, exquisite mastery of tone and dynamics — that she could imbue her work with a level of interpretive nuance that can elude even great singers. On Miss Olivero’s lips, as her admirers often observed, song sounded almost as natural as speech. The net effect, at once titanic and intimate, was the experience of opera in amber, for Miss Olivero was almost certainly the last avatar of the grand histrionics, and genuinely grand singing, that typified a shimmering era in which opera was pitched to the last balcony. Her impeccable technique also let her perform well into old age: She last sang in public at 99 — nearly half a century past the customary retirement age in her line of work. Miss Olivero was well aware that she fared better with fans than with critics. By all accounts as demure off the stage as she was electrifying on it, she appeared to take the disparity in stride. ‘I never had a voice’, she said in 1993. ‘What I had was expression, a face, a body, the truth. If one prefers the opposite, that is their right’. A judge’s daughter, Maria Maddalena Olivero was born 25 March, 1910, in Saluzzo, near Turin. Growing up, she studied piano and voice, and when she was barely out of girlhood she auditioned to sing with a Turin radio station. Hearing her audition (she sang ‘Mi chiamano Mimì’,”from Puccini’s LA BOHÈME), the conductor Ugo Tansini, as was widely reported years afterward, pronounced judgment: ‘She possesses neither voice, musicality nor personality. Nothing. Absolutely nothing! She should look for another profession’. Auditioning for the station a second time, the young Miss Olivero was taken on as a pupil by Luigi Gerussi, a prominent if draconian voice teacher. ‘This is the last time you are going to say ‘I can’t’, Miss Olivero recalled him shouting. ‘Those words must not exist. If necessary, I’ll see you dead to get what I want! Die afterward if you wish, but first you must do what I want’. She persevered, and under his tutelage she made her operatic debut as Lauretta in Puccini’s GIANNI SCHICCHI in Turin in 1933. Engagements throughout Italy followed. In 1941, Miss Olivero married the industrialist Aldo Busch. Between her desire to be a traditional wife and the difficulties of performing during the war, she all but retired, singing only in local benefit concerts. Then, in 1950, Cilèa, who considered Miss Olivero to be the supreme embodiment of his doomed heroine Adriana Lecouvreur, implored her to sing the role once more in a production in Brescia the next year. Though he would not live to see it - he died in November 1950 - the performance brought her wide acclaim. Miss Olivero made her United States debut with the Dallas Civic Opera in 1967, as Medea. Sometime later, hearing her sing Tosca in Dallas, the mezzo-soprano Marilyn Horne helped bring her to the Met. She made her Met debut in 1975 as Tosca, singing the role a total of three times there. She reprised the part with a Met touring company in 1979. Over the years Miss Olivero also appeared at La Scala in Milan, on opera stages in Paris and London, and with the New Jersey State Opera. In 1977 and 1979 she sang two critically praised recitals of arias and art songs at Carnegie Hall. 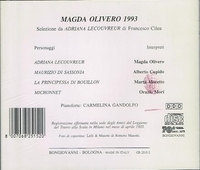 Her (legal) recordings include [Liù, opposite Gina Cigna in] a TURANDOT from the late 1930s; a FEDORA from the late ’60s; excerpts from ADRIANA LECOUVREUR, recorded in 1993, when she was in her 70s; and ‘Magda Olivero: Celebrated Death Scenes’, released [by VAI] in 1994 [V1919]. Miss Olivero can be seen, and heard, in the 1999 documentary OPERA FANATIC, directed by Jan Schmidt-Garre.